Since the beginning of the year I have been playing with some new stuff, new to me anyway. I have some definite goals in mind for this stuff, but I had to start somewhere. We were so poor growing up that we girls were only allowed one positive attribute each. I was the smart one. (The day I taped my first Simply Quilts episode I would have given anything to be the pretty one.) It seemed like grown ups were constantly taking the crayons out of my hands and substituting an abacus. (That's how old I am.) 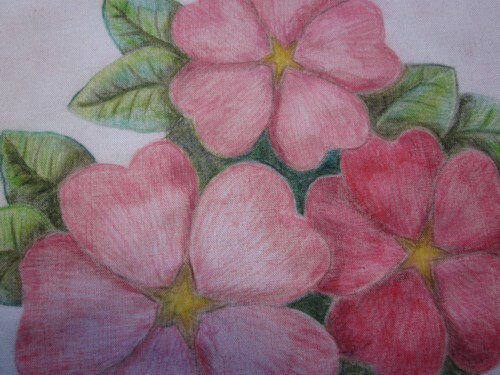 I did excell in the sciences and math, but always yearned to be an artist. By the time I was an adult I was throroughly convinced that I had no artistic talent. I thought it was something magical that one was born with already built in. I now understand that with training and practice and passion, we can be what ever we want to be. Sure, each of us is born with strengths and weaknesses, but my life philosophy has always been anything worth doing is worth doing badly for as long as it takes to master it. Before I could put these tools to task on my ideas I needed to figure out how they work. 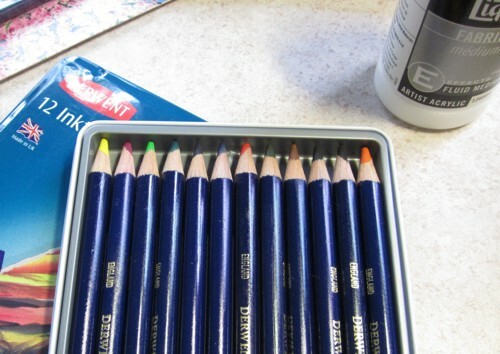 I started with these water color pencils from Derwent. 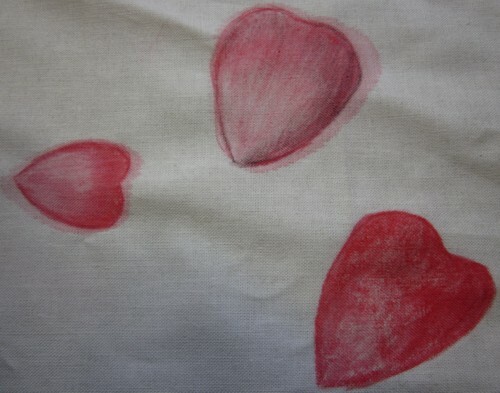 They color on fabric very nicely, and then bloom like watercolors when water is painted on. I loved how the colors brightened and deepened with the water, but I didn't like the wicking out around the design. After rooting around in my art supply stash (I thought that owning art supplies would make me an artist, which is just silly, but I sure am glad that I bought them on speculation! ), I found matte fabric medium. It worked just like the water on the pencils, but no wicking! The colors blended beautifully without running all over the place. That's just what I wanted. I don't know why I'm having so much fun with this challenge, but I am. I suppose it's a bit like taking part in a block of the month, but I've always been on the designing end of that process. It's not quite as exciting when you already know how it ends. So, for challenge two we were to knit something in a color from our national flag. This rule was a little loosey goosey, red could be pink, for example. Isn't it pretty? 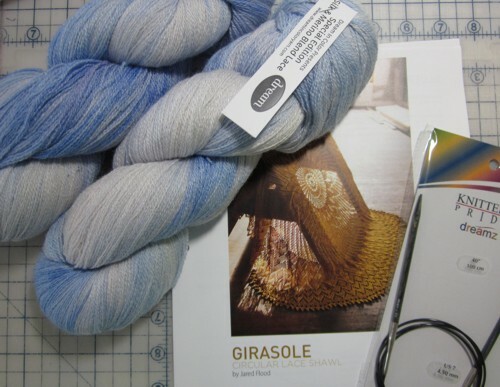 I started with the pattern Girasole because I love the center pattern. And for the knitters out there, for knitting lace, I'm loving the Dreamz needles from Knitter's Pride. 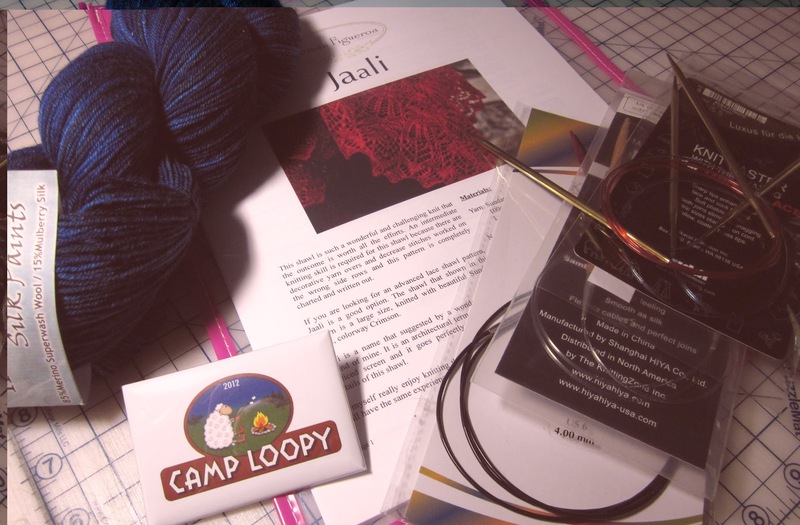 The long, tapered points are perfect for making nupps (pronounced noop, it's a kind of bobble thing used in lace knitting), and the wooden needles are much kinder to my hands. Midway through the pattern I switched over to EZ Anniversary Pi shawl, the "camping" one, for a lacier finish than the original pattern. 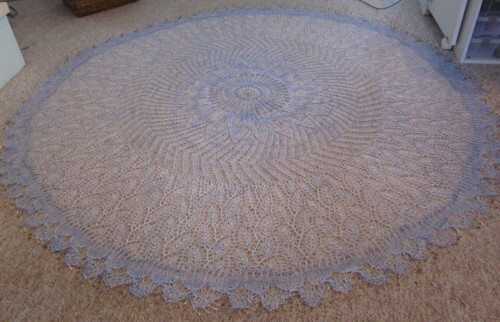 A shawl isn't done until it's blocked. It's kind of like sewing the binding down, it's the last step before the big finish, but totally unglamourous. I have just the space for blocking, right in front of the fireplace in the studio, although this shawl pretty much pushed the limits. 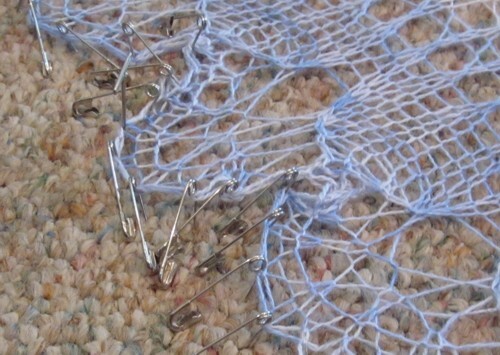 The tools of choice for blocking are the lowly t-pin and yard stick. The challenge with blocking lace is getting enough stretch to open up the holes, but not to pull it so hard that the knitting is strained. 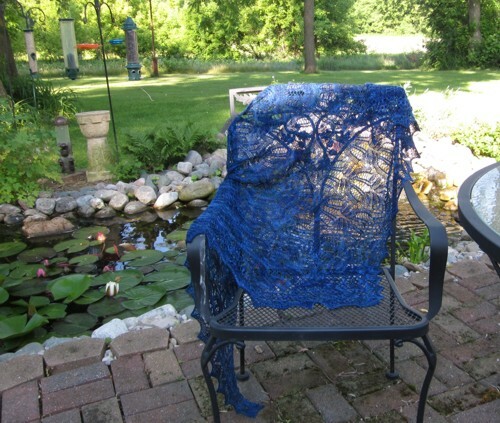 I knit the shawl with larger than recommended needles so it would be extra lacy. Can't ever get enough lacy. 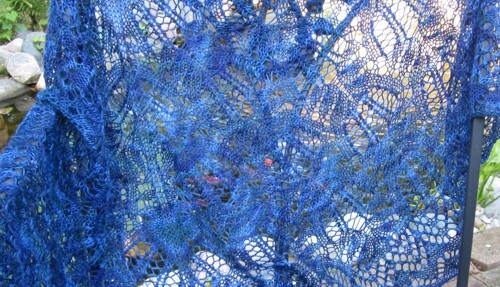 But this shawl, with its scalloped edge, required way, way more t-pins than I had. A girl's gotta do what a girl's gotta do to get her shawl finished. It's been a while since I've had a baking disaster. Baking, pies, cakes, cookies, it's one of my favorite things to do. (Not great for losing weight though.) We've done a bit of entertaining this summer. Our third son, Caleb, graduated from Saginaw Valley State U, with a degree in history, in May. This milestone is especially sweet since Caleb has been challenged by dyslexia. 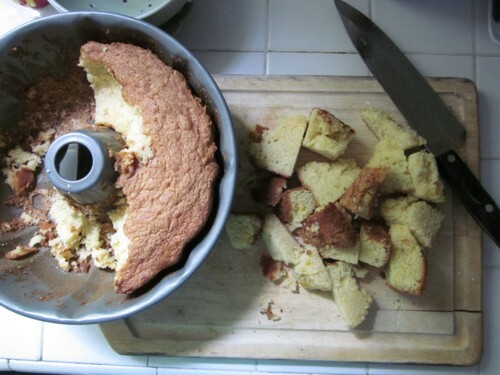 I've never had a problem releasing a cake from this pan. Oh, the pain! The pain! I was so disgusted that I just left the mess sitting there for most of the afternoon, wondering how on earth I would recover from this fiasco. And then it came to me. I'll turn it into a trifle. 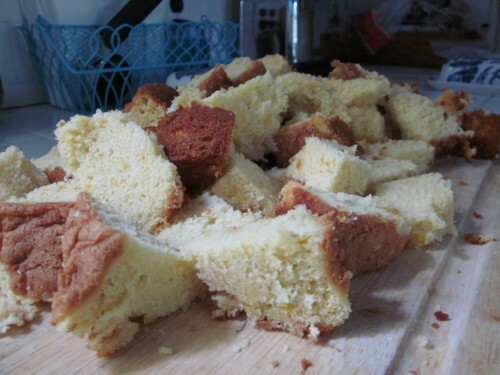 Just chop up the whole lot of it, layer it with fresh fruit and whipped cream. The fruit makes it healthy, right? 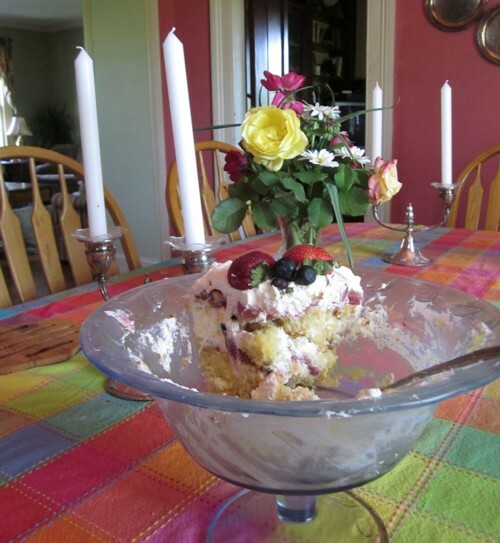 In looking up trifle recipes, I noticed that many of them included lemon curd. After some more surfing the web, (honestly, how did we learn anything before the internet and YouTube? ), I found a terrific recipe for orange curd. In my usual bad blogger fashion, I forgot to take a picture of the assembled trifle (it was really quite pretty). But I did get a shot of it before it was entirely gone. Knitting is what I do so I know I'm not working. 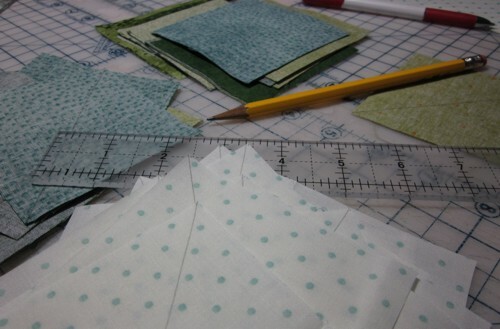 Quilting has become my job, one that I love, but full of deadlines and other pressures. I get giggly about knitting. My commitment to limiting my yarn stash has devolved into storing the yarns in decorative baskets sorted into projects. I have the same passion to stash yarn that once fueled my fabric habit. I wish we had something like Ravelry for the quilting world. It seems like all of our sites for meeting up are hosted by quilting personalities, not that there's anything wrong with that. But Ravelry is a free wheeling love-in for those who love yarn. Groups can form to share a common interest. Designers can post and sell their patterns. Each user can track projects, store pdfs in a personal library, catalogue a stash (no way I want to sum up what is in my stash). The Loopy Ewe is one of my favorite online yarn shops, and this year they are once again running Camp Loopy. It's been a blast. We have a goal for each summer month, dictated by the number of yards of yarn knitted, using a pattern from a designer who is from a different country than our own, using the colors from our national flags, and so on. I'm currently in my shawl phase. 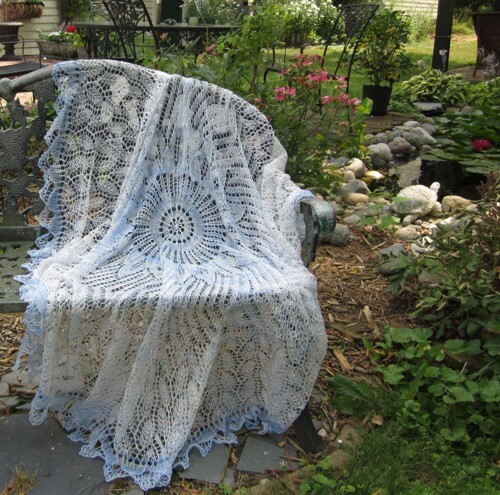 I love knitting lace shawls. The designs are complex enough to keep my attention. It's so gratifying to move from chart to chart and see the design come to life. This is Jaali. I love this designer, her shawls are so very architectural. The last month has lumbered along, deliciously slow and happily, lacking in much excitement. A body can only take so much excitement, you know. I'm right in the middle of my three month break from travel. Entire weeks have passed by without leaving home. I've been keeping busy, for sure, but in a most restful, leisurely pace. Most of what I've been doing quilting wise falls into the hated "can't show you yet" category. Currently I'm working on a quilt for Quilters Newsletter's Best Fat Quarter Quilts 2012 issue that will go on sale in December. I don't know what I was thinking when I designed this pattern. It's fantastically easy and fun to sew. But for some reason I decided to cut squares and draw the diagonal lines instead of just cutting them into triangles. I hate drawing lines! But I think a lot of quilters perceive it as an easier technique than sewing triangles. That must have been what I had in mind when deciding on the method of construction. Drawing diagonal lines to follow adds time to the process, and, I believe, much less accurate than stitching a bias edge, especially when I'm drawing the lines. Working wrong side up, start by positioning the pencil directly in the nearest corner. 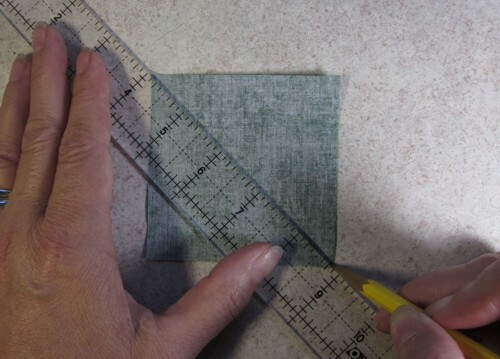 Slide the ruler up to it, which compensates for the width of the pencil's lead. 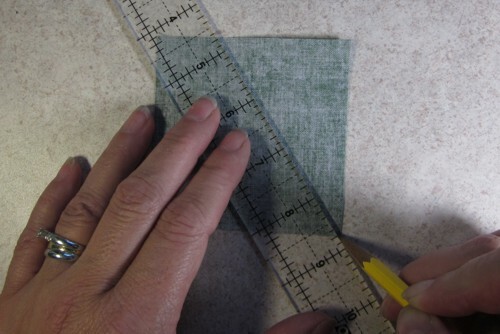 Keeping the ruler tight against the pencil, gently rotate the ruler to position it in the opposite corner, making sure to offset it just enough to account for the width of the pencil lead. For marking lines that will become cutting lines just a regular old pencil works great for me. It shows up on everything except the darkest fabrics. 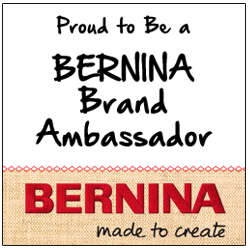 For those I use a mechanical white chalk pencil made by Bohin. Many chalk markers use wax to bind the chalk into leads. When pressed with a hot iron the wax can melt, binding the chalk to the fabric, giving us the dreaded permanent pencil line. The Bohin leads have no wax, and so far, I've never had them stick around past their usefulness.